Hot pink cupcakes- made my 'red velvet way'- using a white mix, some pink and red gel coloring and a lot of frosting- perfect! The other day at the park, one of my friends mentioned in passing by that she was up to do/help with/whatever since she isn't busy at all. I was kind of shocked (she does have a family, home and Church responsibilities, lots going on). It made me wonder if her perception of busy is different than mine, if she is just ultra-capable, or if I am just a crazy person and doing too much. I don't know about you but I feel busy. I try to simplify but every so often it just gets to me that I am busy and there isn't a lot to do about it (especially since I am certainly creating my own reality!) Sometimes there isn't a happy shortcut to simplify certain things but when there is... a way to mix quality and efficiency, fun and useful, it makes me happy. I love experimenting in my kitchen and spending time knocking out big, fun projects (homemade chocolate sweet rolls anyone?) but sometimes I need a showstopper and I need it fast. When MyBlogSpark contacted me about the Pillsbury Bake-Off I thought it looked like a lot of fun. I love perusing recipes and seeing how creative people can be (and thinking about the $1 Million prize on the line for the best recipe?! Wow!) There are a ton of great recipes to check out- for breakfasts, appetizers, dinner, desserts. I love recipes like these that feature simple, easy to follow instructions and ingredients and yield infinite different results. It's easy to customize and change things up based on your own preferences. I can't believe how many different things you can do with cresent rolls. Myself, I usually doctor up cake and brownie mixes. Cereal is another tricky one (way more uses beyond breakfast!) What is your favorite short cut? Something I am missing out on? As for the recipes... I am going to try the Hazelnut French Silk Turtle pie first. Wow. Instead of oreos, I use Chocolate Cheerios to make press in crusts for cheesecakes and pies. It sounds kind of weird, but it's crazy delicious and simple too (just some melted butter and whirl in the food processor). Plus, I feel a lot better about eating Chocolate Cheerios than oreos, even if that's fuzzy math. 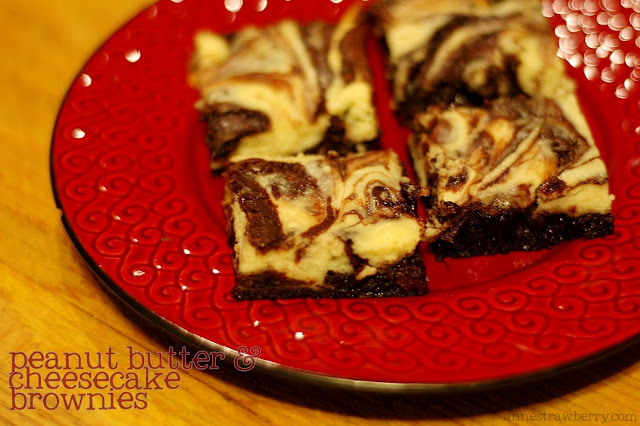 Peanut butter and cheesecake swirled brownies take less than ten minutes to prepare and taste divine. Then topped with caramel and pecans. 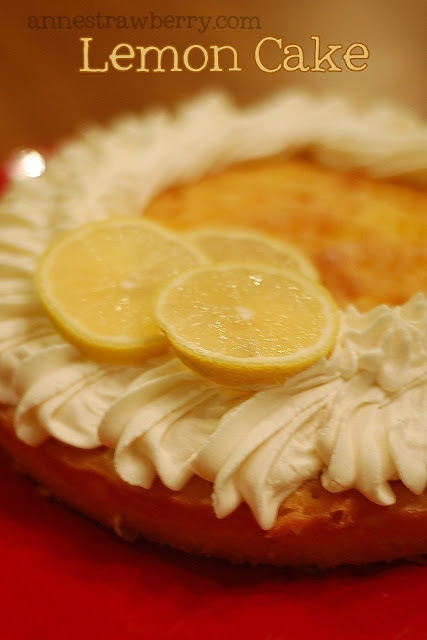 I really think anyone can bake delicious food for their families without too much stress. We are all so busy but everyone needs to eat, so why not show your love to your family by making them something special? MyBlogSpark and Walmart have a prize pack to give away to one lucky reader- a $25 Walmart giftcard to stock your fridge and pantry with yummy food for your families so you can have your own little bake-off. Leave a comment (make sure your profile is linked to your blog or email or leave it for me) by Sunday night, midnight AZ time to be entered. One entry per person. And before you shop, check out this site for great General Mill's product coupons- even though I am beyond tired of picking them up off the floor, there's no such thing as too many Cheerio's around here! Disclosure: The gift card, information, and giveaway have been provided by Walmart and General Mills, through MyBlogSpark. 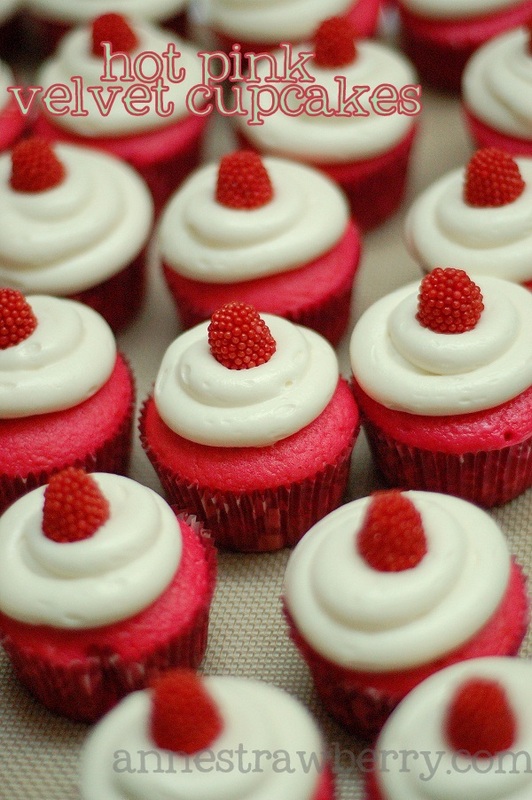 Besides the satisfaction of making these yourself, you can customize the size, decorations and flavoring. 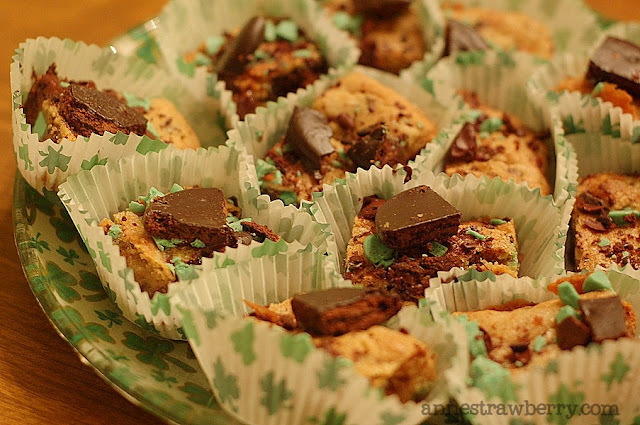 Next time I make these I will make them itty bitty with my smallest cookie scoop. I finally bought a package of 'chocolate dipping tools' (only a couple dollars at Michael's but I think this nice set from Ateco should be in my kitchen soon) and I am confident that will make these even more fun to make. Give them a try for St. Patrick's Day and let me know what you think! You can see more process photos here. Add condensed milk, 2 cups of powdered sugar, and peppermint extract to a large mixing bowl. Mix everything on medium speed using the paddle attachment until all the ingredients are well incorporated. Add more powdered sugar, a half cup at a time, until the dough is pliable like firm modeling clay. Note- at this point, I kneaded the dough by hand for a couple minutes to get it extra nice and well mixed. Roll 3/4″ balls of dough between the palms of the hands (I used a small cookie scoop for this step with less than a tablespoon of dough- the smaller patties look neater and are better portions I think). Press each ball down slowly and set the flattened disk on a flat cutting board or plate. Transfer peppermint disks to the freezer for no longer than 30 minutes. While the dough is chilling, temper the chocolate coating. Place chocolate chips in a microwavable bowl. Melt the chocolate in 30 second increments, making sure to stir after each time until chocolate is smooth. Stir in shortening to thin the chocolate. Remove patties from the freezer. Place a patty on the tongs of the fork and dip in the chocolate until completely covered. Allow excess chocolate to drip off the patty before setting each one on top of wax or parchment paper. 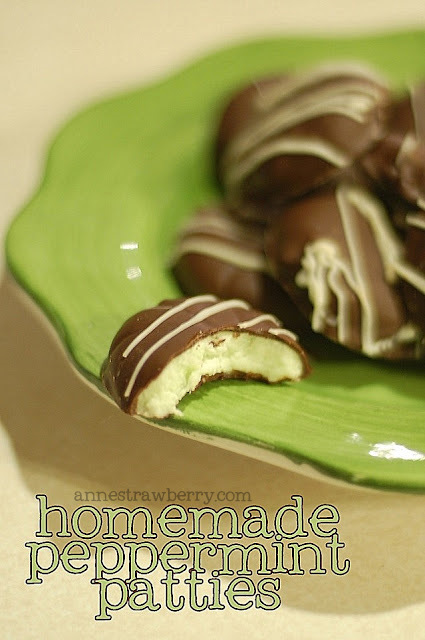 Allow the chocolate coated peppermint patties to completely set up. This can be done quicker by placing the patties in the refrigerator. The peppermint patties are ready when they are dry to the touch. Enjoy! Note- I melted some candy melts and drizzled them over the top for the finishing touch. After they set, package them up in cellophane bags, tie with a ribbon, and enjoy your easy, delicious, homemade treat! First friends, I would like to apologize for leaving a picture of chips up on my blog for so long. Yummy chips, but chips still. I have actually made a million treats lately between pinewood derby, baby showers, blue and gold banquet (not to mention treats for the meetings to plan all that stuff, don't you think treats make meetings better?) Spring is here and it doesn't usually last too long, so we've spent more time at the park (Little Man broke his foot there jumping seven feet off a piece of playground equipment, working on projects in the garage, and at the doctor's office- see before mention park incident and spring air sharing germs and allergies left and right. So my apologies again for the slow posts around here. But I have a good one today- courtesy of my original food blog crush, Peabody. If you haven't 'met' her before I'd encourage you to stop by. Her photography is stunning, her recipes are incredible and she's totally hilarious. When I read her blog I don't feel so bad about my baking habits and I also identify with her a lot because she has more than one KitchenAid (for the record, I don't, but I think that would be awesome! Maybe in my fantasy double oven kitchen someday?) These blondies are all kind of deliciousness mixed together- chocolate chip cookie dough, girl scout cookie thin mints, ghirardelli chocolate, mint chips! To see the recipe, please stop by Peabody's. She is incredible and you won't regret it! Do you have a favorite St. Patrick's Day mint recipe? Are you going to have corned beef next week? 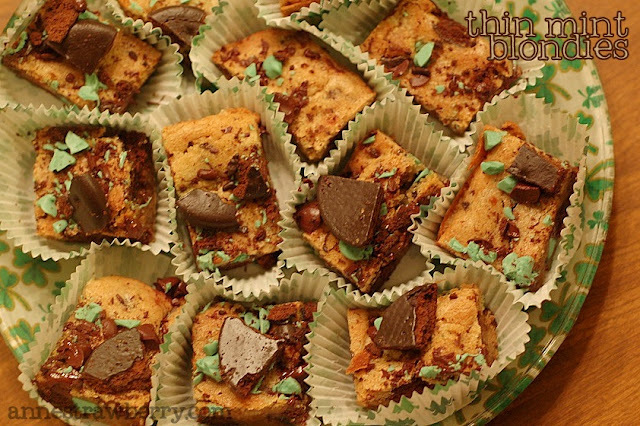 Do you have a great source for mint chips? Spill!